Sew What's Up • View thread - I made a baby hat. I made a baby hat. DISCLAIMER! I did not make this actual hat in the picture. Camera is giving me headaches. I made one just like it out of white pearlized yarn. Great pattern, easy to do and quick. I made it with 4 double point needles but it can be made newborn size on 12" circulars also. This is for my great niece that should be coming along in January. I'm starting on some Mary Jane booties today. I'll hopefully get a pic of the set. I'm also planning to make a sweater or something else to go with it all. 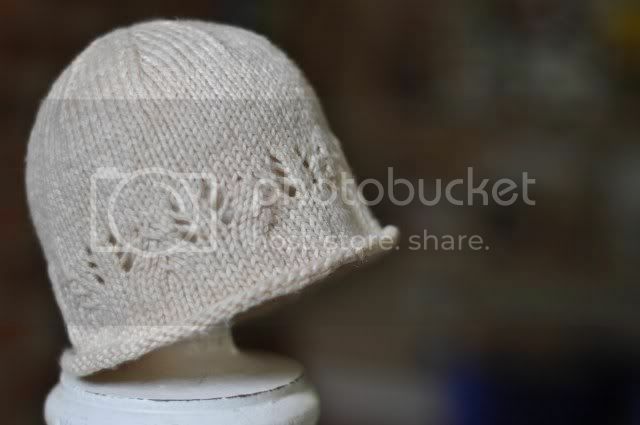 Re: I made a baby hat. Very nice Lennie. I've never knitted anything that complicated. I just bought a pattern for Mary Jane slippers, but have to finish some shawls before I try it. I hope to see a pic of your finished set. I bet is is just as beautiful. Congratulations for being creative and making it. Did it feel good to finally make something? Love the hat...I used to knit small things like that for my first nephews who came along. Thanks, everyone, and yes, Theresa, it really feels nice to be making something. Fall is in the air (for however long it lasts ) and that makes knitting appealing to me always. I do feel kind of funny just posting a picture of someone else's work. My new battery's charging for the camera but it's not holding. I think the camera's dying. That's an adorable hat! I like the cabling. I'm into cables latelyl, now that I figured out how to make them.